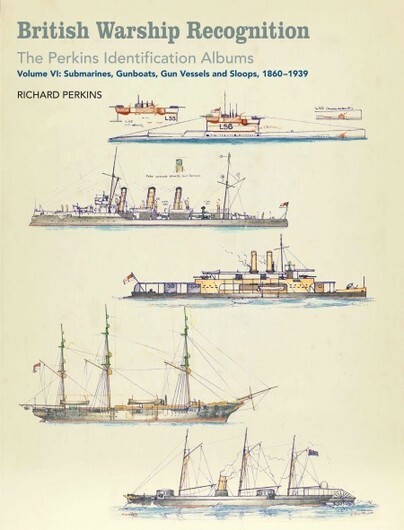 You'll be £56.00 closer to your next £10.00 credit when you purchase British Warship Recognition: The Perkins Identification Albums Volume VI. What's this? The sixth volume of the series covers all submarines up to 1939, torpedo gun vessels, the diverse types of gunboat (from masted gun vessels through coastal ‘flat-irons’ to river patrol craft), and sloops of various descriptions. A masterpiece of incalculable value without which today we could not have information on the countless warships that sailed the seas in the service of his gracious majesty. What you have is very much a 'bible' of help to identify not only individual ships in archive photos, but also to indicate what year it shows the vessel. Individually the series of books are a delight to see as the growing set makes a magnificent reference. Although conceived for the purpose of identifying ship images, what Perkins' albums actually provide is the most thorough and comprehensive record of British warship appearance ever achieved. They are, to put it mildly, fascinating. In this edition by an Introduction by ANDREW CHOONG, a curator at the National Maritime Museum for whom the albums are an indispensible reference.